Imagine the life you've always dreamed of living, with no barriers or boundaries. Imagine a life rich with success and achievement, endless physical vitality, heartfelt personal relationships, and a deep sense of spiritual fulfillment. 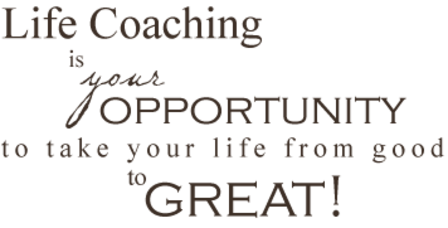 Life Coaching is a designed alliance between coach and client where the coaching relationship continually gives all the power back to you, the client. I believe that you know the answers to every question or challenge you may have in your life, even if those answers appear to be obscured, concealed or hidden inside. I use experience and intuition to know the right questions to ask and having the right tools and techniques to empower you to find those answers within yourself. You, are truly the only expert in your life who knows who you are who you want to be and what you need. You are the only expert who can recognize what is best for you. I am simply a guide who will use the coaching process to reveal to you with greater clarity how to live a life filled with joy and happy, loving relationships. As your coach, I help you discover what your passion and purpose, your individual gift to the world. Every day we make choices to do or not do many things. These choices may range from profound to trivial and each one has an effect that makes our lives more fulfilling or less fulfilling, more balanced or less balanced, that make our process of living more effective or less effective. Life coaching helps you learn how to make choices that create an effective, balanced and fulfilling life. I help you forget all that you know, and begin the journey to a life you have always dreamed of. I will help guide you to reconnect with your heart in a way that transforms your passion for life and you will once again remember what it is like to live with enthusiasm and joy!! To say my life has been impacted positively by your life coaching, would be the understatement of the year. She often speaks that "Life begins at the end of your comfort zone". I found this was definitely true and should be expected. Without this, there would never be any change. For myself, making significant changes in my life was very intimidating, but her support and encouragement became very beneficial every step of the way. For myself, I found that she was and continues to be a very caring and attentive listener which is a must for any life coach! For my situation, I went to seek her guidance primarily in the area of relationships. After a few sessions, my dating life went from essentially non-existent to having more dates in 1 month than the previous 5 years combined! This has also led me to now be in a wonderful relationship with a beautiful woman that I love very much! This would not have ever happened without Debbie and her life coaching! Debbie is the owner of SevenHotYoga.com but she is also an amazing Life Coach and retreat coordinator. I consulted Debbie for guidance & advice in the areas of my business and personal life and she shared with me some amazing life philosophies that have reoriented the way in which I approach accomplishing my dreams. She's an amazingly intuitive person that can easily help you accomplish what you want in life by helping you see what you are creating in your life now and then helping you shift your perspectives in order to create the life you want to live! Debbie's Business/Life Coaching services are a bargain and I would recommend her to anyone without thinking twice. Oh and she's also a rockstar yoga teacher who runs an amazing studio, make sure to take her, or one of her other teachers classes! You'll feel great!